Ever since the adorable yellow crinoline I bought at Anthropologie proved to be too short, I've been working on my own version. I call it the layer cake crinoline because it's really just layers of fabric stacked on top of one another, each longer than the one before it. This was simple to make - in fact, the top part is just a shortened version of the half slip from my tutorial! I wanted something that wouldn't be so full as to appear costume-y, but that would still provide just a little bit of body to my full skirts. Substituting cotton organdy for tulle did the trick, as well as being easier to work with. Doesn't it make a world of difference? Check back later this week for a tutorial on making this easy modern crinoline! Wow, I can't keep up with you. I'm just about to post the slips I made from your first tutorial! Now I definitely have to make one of these too. Very nice! I love the look of the skirt with the crinoline. I have been collecting vintage patterns, but really shied away from doing any full skirts, really because I don't have the proper garments to go under them. I'll be eagerly waiting for your tutorial! To be honest, I am really considering making an incredibly full, flouncy, lacy crinoline. The thought of walking along in a black skirt with flashes of foamy lace underneath just is doing it for me lately. Who am I? What happened to she who wears jeans? What is my name? Can't wait for the tut! Sorry, couldn't help but rhyme it. I've been wanting something like this for a while and couldn't find a vintage pattern in my size... oh and I was too blerg to try drafting up my own :P Thanks for helping these lazy bones. How yummy! It does make the full skirt look nicer. Oh that is too cute. 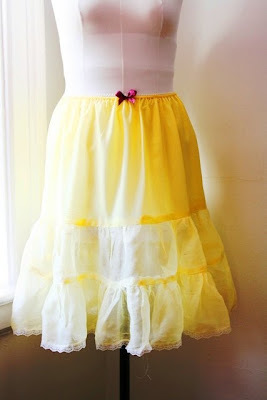 The yellow is just lovely and would make me wish for a breeze to blow up my skirt a tiny bit to show it off! Did I miss the tutorial?